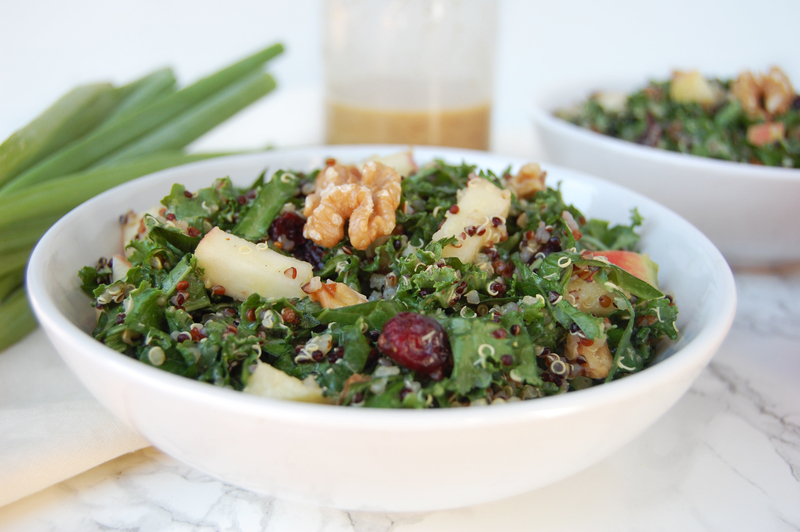 Apple Quinoa Fall Salad - Are You Kitchen Me?! If an apple a day keeps the doctor away, what does two or three do?? Because apple season is here and I am about to be the healthiest kid on the block. I’m ready to start jamming my favorite fruit into every meal possible. 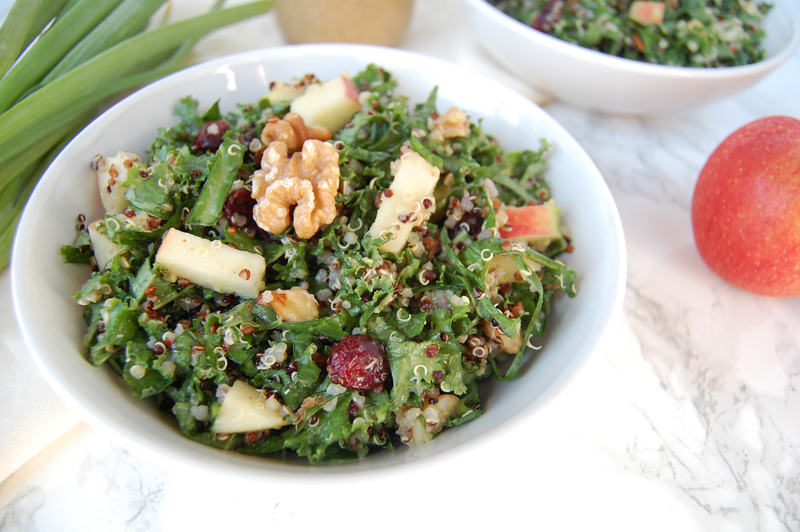 Evidence: Apple Quinoa Fall Salad allllllll week! 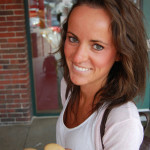 The first day of fall was only a few days ago but I’ve already scooped up bushels of apples from our farmer’s market. I eat apples year round, sometimes having to resort to pathetic bagged miniatures, so this time of year is like heaven on earth. Big, ripe, crisp, juicy, local, fresh honeycrisps, pink ladies, fujis… I can’t even. The obvious thing to do when apple season hits is to bake all the sweet cinnamon-y desserts. And don’t get me wrong; I’m SO into that. But I wanted to play around a little and make something savory for a change. 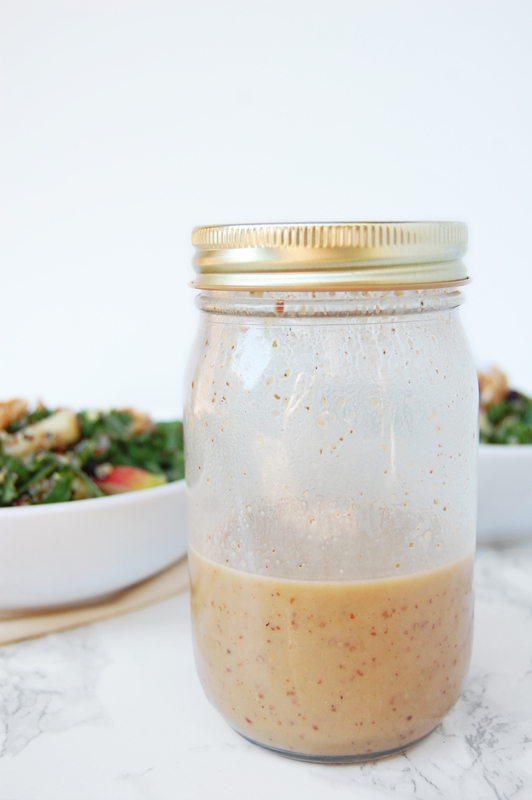 I’m thrilled with the dressing for this recipe as it’s oil-free (!! ), bright, tangy, and laced with hints of fall spices. It’s not so freezing yet that all I’m craving is warm, comforting casseroles and soups. I’m still trying to milk the last few drops of warmth from the sun so I settled on a salad to get through the transition. Plus, salads are perfect lunches- I now have a salad for every workday this week all packed and ready to go! Apples to apples, no other salad can compare! Ease the transition from summer to fall by incorporating fall spices and flavors into a hearty, crisp salad! 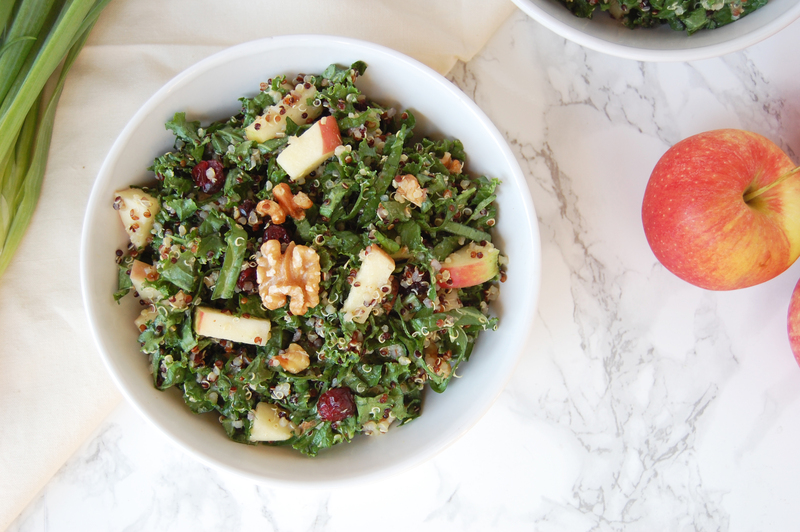 Apple Quinoa Fall Salad is the best of both seasons! Combine all dressing ingredients in a jar and shake well to combine. To keep the apples from turning brown, mix one cup of water with 1/8 teaspoon of salt and a splash of apple cider vinegar and pour over the chopped apples. Wait about a minute then drain and rinse the apples. Set aside to dry slightly. Combine all salad ingredients in a large bowl and toss to combine. Chill until ready to serve. Enjoy! How to Cook Quinoa: Rinse quinoa in a fine mesh sieve before adding to a small pot with about 2 cups of water (I use a little less) and a healthy pinch of salt. Bring to a boil, cover, and reduce to a simmer for 15 minutes. Set aside for 5 minutes with lid on, then fluff with a fork.